This entry was posted in Book Memes, Teaser Tuesdays and tagged book memes, teaser tuesdays, tipping point, tomas byrne by Yvo. Bookmark the permalink. Have to admit it’s probably not a book I would go for as I tend to avoid anything political but I hope you enjoy. I normally don’t go for political reads either, and this book unfortunately has reminded me why. It’s not a bad read, but it’s quite a slow pace and not exactly my cup of tea. It definitely sounds like a great read; I hope you will keep enjoying it! The story itself is interesting, although I’m not sure if it’s for me… The pace is quite slow and I’m having a hard time to stay focused. I think I would rather read Delete like you right now haha. Haha, Delete is definitely not on the slow path! It’s a lot of fun learning more about online games but I feel like an old lady! Haha I’ll probably feel the same; it’s been a long while since I last played one myself. 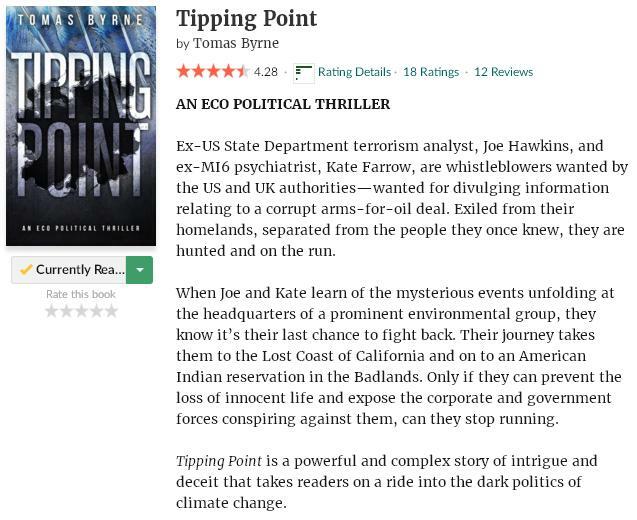 I haven’t read that many political books either, and I’m not sure it’s really my thing now I’m reading Tipping Point. It’s not a bad read, but it has quite a slow pace and a bit ‘dry’. well that is a very intriguing teaser. what did they do?